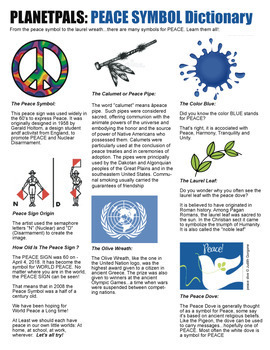 What are all the Peace Symbols and Signs in the world and why? 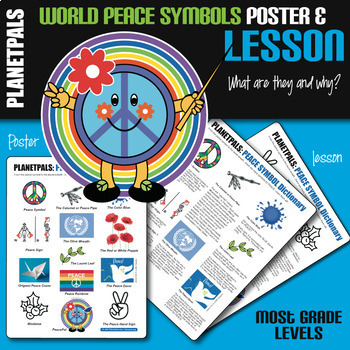 Post the Peace symbols Cover page poster in the classroom as a reminder of the symbols. Perfect lesson for For International Peace Day! 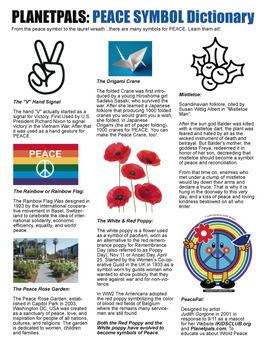 A Historic Dictionary of over a dozen peace symbols! Couple this with other peace activities available on Planetpals TPT Store or the website. Best places on Earth to learn about world peace-peace activities, history, fun facts: Ikidsclub.org Educational pages.